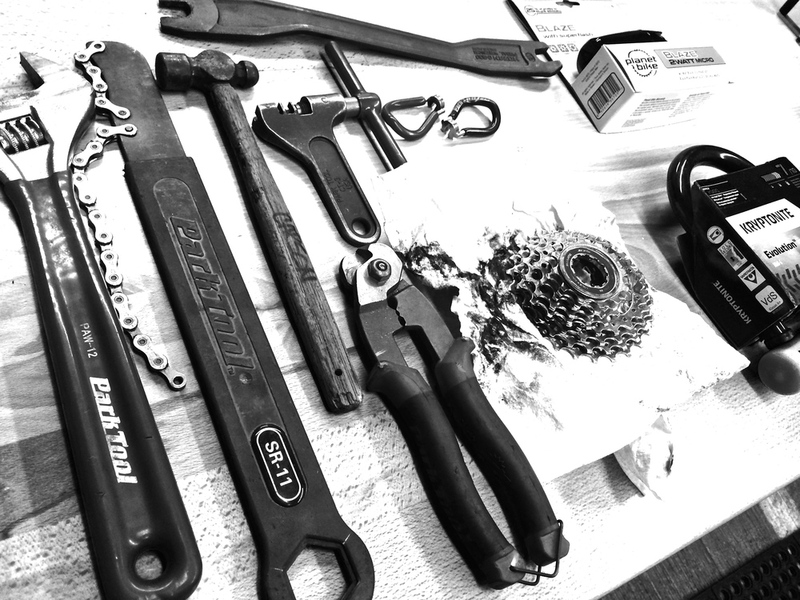 Does your bike need some loving, but its not ready for a full tune-up? The quick tune will get your bike spiffed up for Bike-to-Work month or Ride-in-the-Rain when you need your bike working at its best! Every Quick Tune will: Secure both brake levers; secure calipers; adjust brake pads; clean rims; set pad clearance; center brake pads, lube derailleur cables; lube, secure and adjust shift levers; lube and adjust derailleurs; secure handlebars, stem, seat post, seat, crankarms, chainrings, pedals, accessories; wipe down frame. Been a while since your bike has been in to the shop? Are things just not as smooth or fun as they used to be? The full tune is a comprehensive repair package that will covers everything that a quick tune will, but also includes a more intensive cleaning and lubing as well as a full wheel service. Its a perfect way to freshen up your daily commuter or breathe new life in an old bike. A full tune will: Adjust both hubs; adjust headset; adjust bottom bracket; Secure and lube both brake levers; lube brake cables; secure calipers; adjust brake pads; true wheels laterally as necessary to allow brake adjustment; clean rims; set pad clearance; center brake pads, trim and lube derailleur cables; lube, secure and adjust shift levers; lube and adjust derailleurs; secure handlebars, stem, seat post, seat, crankarms, chainrings, pedals, accessories; clean frame. No additional service charges required for installation of new brake and derailleur cables, brake pads, brake calipers, or derailleurs. Reg: $35 / Children's Price: FREE! Getting a bike out of the garage and want to make sure its ready to ride? A safety check covers all the basics of making sure your bicycle is ready to ride. A safety check will: Secure both brake levers; secure calipers; adjust brake pads; center brake pads, secure and adjust shift levers; lube and adjust derailleurs; secure handlebars, stem, seat post, seat, crankarms, chainrings, pedals, accessories; wipe down frame. Adjust both hubs; adjust headset; adjust bottom bracket; Secure and lube both brake levers; remove and clean calipers; remove, trim, and lube brake cables; secure calipers; adjust caliper pivots; adjust brake pads; clean rims; set pad clearance; center calipers; remove, trim and lube derailleur cables; lube, secure and adjust shift levers; remove, disassemble, clean, lube and adjust derailleurs; remove and clean chainrings, chain, and freewheel; clean frame, rims, and spokes; secure handlebars, stem, seat post, seat, crankarms, chainrings, pedals, accessories; correct lateral, radial, centering, and tensioning errors in both wheels. No additional service charges required for installation of new brake and derailleur cables, brake pads, brake calipers, derailleurs, chainring, chain, or freewheel. Overhaul both hubs; headset; bottom bracket; adjust pedals (if serviceable); secure and lube both brake levers; remove and clean calipers; remove, trim, and lube brake cables; secure calipers; adjust caliper pivots; adjust brake pads; clean rims; set pad clearance; center calipers ; remove, trim and lube derailleur cables; lube, secure and adjust shift levers; remove, disassemble, clean, lube and adjust derailleurs; remove and clean chainrings, chain, and freewheel; clean frame, rims, and spokes; secure handlebars, stem, seat post, seat, crankarms, chainrings, pedals, accessories; correct lateral, radial. centering, and tensioning errors in both wheels; clean frame. No additional service charges required for installation of new brake and derailleur cables, brake pads, brake calipers, derailleurs, chainrings, chain, or freewheel. What is a bike fit? Good question! A bike fit is a systematic way to adjust your bike to fit your body, increasing efficiency and comfort! James is a BIKEFIT certified fit technician and would love to help you ride in comfort! Schedule an appointment today! The sport fit covers all the basics for a comfortable ride: adjusting the saddle position (height and lateral position), adjusting handlebar height and reach. The fit includes the option of trying new saddles, handlebars, grips, and covers the labor for installing the appropriate parts. All parts and accessories are not included in the fitting. A sport fit generally takes an hour to an hour and a half to complete. Reg: $250 - Children's Price: $125. The pro-fit incorporates all the elements from the sport fit, but also includes an intense focus on the foot, knee, and pedal interface. This focus is meant not just in enhance the riders' comfort, but also their power and efficiency when riding. The pro-fit accomplishes this through the manipulation of the rider's pedal and cleat positions to bring the hips, knees, and ankles into optimal alignment. A pro-fit generally takes two to three hours to complete. removes drive train from bike, de-greases it, re-installs and re-greases components.